With the accreditation of our calibration laboratory, we have underlined our competence in the field of torque technology once again. Here we can calibrate not only the torque range, but also the rotation angle range in order to cover the complete functional area of our indicating (eTAC) and clicking torque wrenches. In addition to the tried and tested factory calibration, the DAkkS calibration of our torque wrenches is now available. Calibration Torque wrenches are used for connections with a precisely pre-defined torque. The accuracy of the wrenches and the correctness of the set values is therefore essential. We strictly recommend an annual inspection and calibration of your torque wrenches. Please note that the inspection interval can be reduced if you reach the recommended upper limit of 5,000 load cycles earlier through more intensive use. 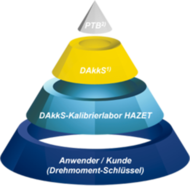 For the DAkkS calibration, send your HAZET torque wrench to our calibration laboratory. With every calibrated wrench you will obtain a calibration certificate and a calibration mark. If it is discovered that your torque wrench is outside of the tolerance when calibrating it, you will be informed by us in writing and you will at the same time obtain a quote for adjusting and re-calibrating your torque wrench. You will of course obtain both calibration certificates for this.